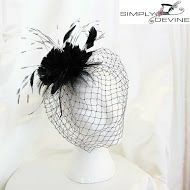 Stunning and mysterious black veil fascinator with a pretty feathered flower and black quills. 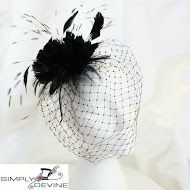 This peek-a-boo fascinator is the height of sophistication and sits on a slim black band for comfort and discretion. This is a perfect fascinator to complement any outfit and is versatile enough to contrast with any colour-way. Perfect to wear at a wedding, christening or the races.